Seventy-one people were shot and 12 killed in Chicago last weekend, which was the city’s deadliest weekend yet in 2018 – and the deadliest weekend in at least two years. Last Sunday, Aug. 5 at 7 a.m., three people were shot, one fatally, at Leclaire Avenue and Washington Boulevard, just steps from my church, St. Martin de Porres. We need to do something differently. That’s why I went on Fox & Friends last Monday, Aug. 6 to say again that Illinois should not be considered a Trump-free zone. I said that Mayor Rahm Emanuel should work with President Trump to help our Chicago communities that are most affected by violence. Illinois sends more taxpayer dollars to the federal government than most states, and we have to make sure our tax dollars are being used correctly. We can’t make progress by being divided. I’m not throwing the mayor under the bus – I want to let him know that we want to work with him. But it is my view that as long as we’re divided and fighting against the president and not getting the resources that we need, progress is not going to happen. Now, I’m a Democrat, and I’m also saying that Democrats must step up. All Democrats, all of my colleagues, must step up and put politics aside. We must work with President Trump. and we must demand that we get help in the city of Chicago, on the West Side of Chicago and for our South Side communities, too, so that we can bring safety to all of Chicago’s communities. But the only way the president should come here is if he’s coming to announce something strong, a comprehensive plan to help us in Chicago to deal with all of violence and bloodshed that respects the needs of people living on the West and South sides. We have established the West Side Development Task Force to come together to demand economic development on the West Side. The work to end the blight on Chicago’s West Side will replace vacant lots with businesses and residents. The task force will have a comprehensive plan to generate a capital bill request that will be filed in Springfield in January. This past week we filed double the number of petition signatures needed to put a referendum on the November ballot asking 29th Ward voters if the city and state should work together to build a new comprehensive high school in Austin. We also have a 2020 Census Task Force, so we can get an accurate count to get the resources that we need. These are some of the things we need to end the bloodshed on the West Side. These are some of the resources we need to make the West Side strong. We need our federal tax dollars to work for us. We need to make positive progress to stem the current violence. Demand that within 30 days city, state and relevant stakeholders present a comprehensive plan to end deadly violence. Form a concrete plan to end the flow of illegal drugs and guns into the South and West sides of Chicago. Deploy additional resources from state, city, and county to violence – affected communities to provide behavioral health support. We must show that we have the will to use smart people and smart ideas to decrease violence in our communities. Let’s pray together – and act together – to end violence. 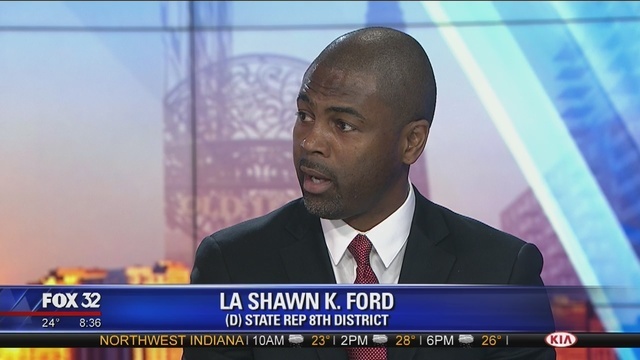 Please contact me at repford@lashawnford.com with your ideas. His primary opponent, Oak Park River Forest High School teacher Anthony Clark, said he would have attended if he had been congressman. The two will face off in the Democratic primary, which is March 20.